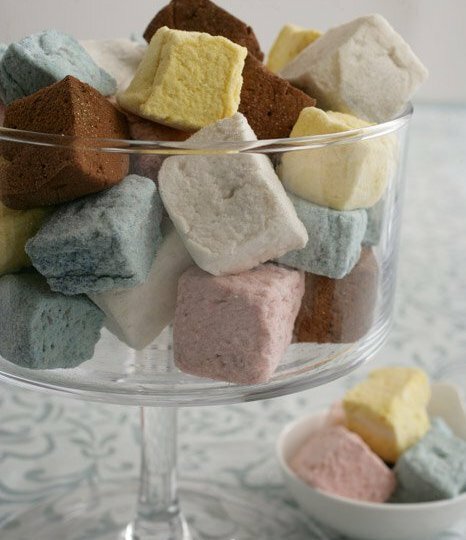 Chef Truman's Handmade MarshmallowsThe idea for Chowgirls came to Heidi in 1998, when she quit smoking. As a distraction, and also as a way to keep on the path of better health, she thought about starting a business based on local, organic food, long before those were household terms. The idea rattled around until Heidi met Amy Lynn Brown in 2003. Neither Heidi nor Amy came from a culinary background, but they both shared a passion for food. They started Chowgirls in March of 2004 and decided to try it for a year. The Chowgirls team, which now includes kitchen and office staff, celebrate their seven-year anniversary this month. Chowgirls has won a number of awards, including Best Green Caterer from Minnesota Bride. Heidi and Amy are still involved in concepts and recipes for new dishes, but Chef Truman Olson now leads the kitchen team. Their mission now is the same as when Heidi and Amy launched Chowgirls: to make good food affordable, with all the connotations that the word "good" has to SGT readers: local, organic, sustainable, and humanely sourced. Chowgirls uses eggs from Larry Schultz, butter from Hope Creamery, and cheese from Pastureland, Shepherd's Way, Stickney Hill, and other local farms. They use milk and cream from Cedar Summit Farm, beef from Thousand Hills Cattle Company, pork from Fischer Family Farms, and fish from Coastal Seafoods. Last fall, Chowgirls took over the lease to their building, which they share with the Rosalux Gallery. Their plan is to host parties, rehearsal dinners, and events like quarterly dinners, such as the one on Valentine's Day. The Locavore Love Affair was a five-course meal. Our server was attentive and communicative without hovering or intruding. We began with two appetizers. The first was the Big Woods Blue Canapé, with roasted grape and Marcona almond atop a wine biscuit with a smear of Shepherd’s Way blue cheese, a drizzle of Ames Farm honey, and a sprinkle of lavender. It was a sweet, perfect bite. Next was a savory Cauliflower Paté, with slow-roasted organic cauliflower alongside a handcrafted cheese wafer of the award-winning Holland Family's Marieke Gouda. The soup was Butternut Bisque, a sweet sip of organic butternut squash puree and Cedar Summit cream, topped with chopped pistachios and browned Hope Creamery butter. It was warm and rich with contrasting and complementary flavors and textures, perfect for a cold night. This was followed by a bright salad composed of Dragsmith Farms greens, dried cherries, Stickney Hill chevre, housemade ginger-scented pecans, and a balsamic vinagrette. Entrée choices were a Lamb Curry, Minnesota grass-fed lamb marinated in ginger, stewed in a warm, Indian-spiced sauce, and served with cinnamon-scented basmati rice; Pulled Chicken & Yorkshire Pudding, a slow-roasted Callister Farms chicken in Summit Porter gravy, accompanied with traditional British popovers; and an earthy, satisfying Barley Risotto, the Minnesota grain made creamy and al denté with Marieke Gouda and wild mushrooms from St. Joseph’s Forest Mushrooms. After-dinner drink choices were Equal Exchange coffees, Mrs. Kelly's teas, and one that was almost a dessert in itself, the Spicy Hot Cocoa, rich with flavor from Equal Exchange fair trade cocoa, Cedar Summit milk, and the subtle warmth of New Mexico chili powder. Deliciously gilding the lily, the cocoa was served with Chef Truman’s handmade flavored marshmallows. 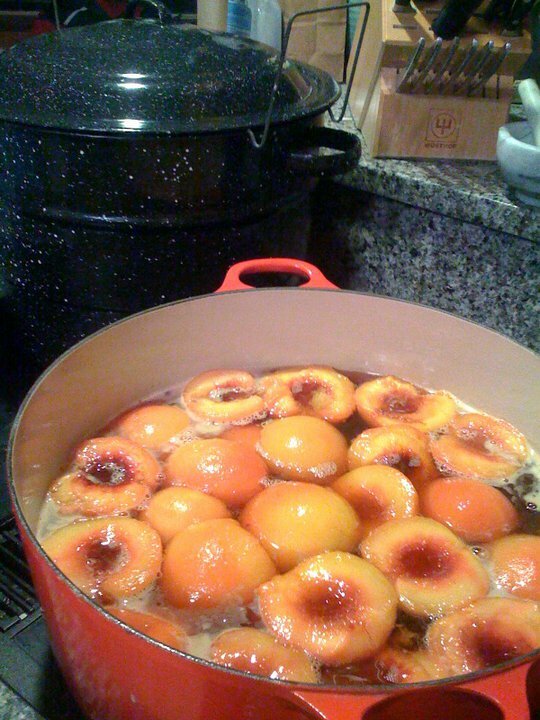 Canning Peaches for Spiced Peach DessertSince my too-full husband couldn't eat more, I had to eat most of both desserts by myself: I did not find this a hardship. There was an intense Chocolate Crème Brûlée, its custard made with Equal Exchange fair trade chocolate, and topped with a caramelized organic sugar crust; and a warm Spiced Peach, originally from Michigan, canned in local honey at the peak of season and spiced with cinnamon, cloves, and allspice, served with softened local cheese, a handmade profiterole, and an anise pizzelle. The plates were beautiful to look at and good to eat. The dishes were seasonal, the ingredients carefully sourced, and the overall experience a delight. Check Chowgirls' website or Facebook page for their next event, and if you have a party or gathering coming up. This is catered food that defies all the usual clichés, so that head, heart and stomach are all well served. 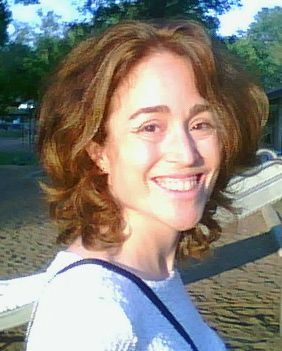 Kristin Boldon is a frequent contributor for Simple, Good and Tasty, who also writes for the Eastside Food Cooperative's newsletter on health and wellness, and for her own blog Girl Detective. Her last post for us was "Feeding the Family: Weeknight Chili with Lots of Leftovers."